In an NPD move that has curiously not been done before, Danone Southern Africa has launched a new brand for the kiddie market, Yo-Jelly, described as ‘a brand new and unique product that combines the fun taste sensation of jelly with the trusted health benefits of yoghurt’. 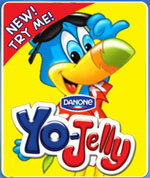 Yo-Jelly, says Danone, is a great snacking option that can be enjoyed anytime, at home or on the go. It has been launched nationwide in strawberry, granadilla, pineapple, creme soda and apricot flavours. Nutritionally, Yo-Jelly has [broadly] 1,5g protein, 15g of glycaemic carbs of which 12g is sugar, total fat of 1,7g, and 10mg of sodium.